With the introduction of the new level editor in the Multiverse update we thought it'd be a good idea to put together a basic guide to get you started with the level editor! In order to use the level editor you must create a Multiplayer session with the level editor panel turned on. 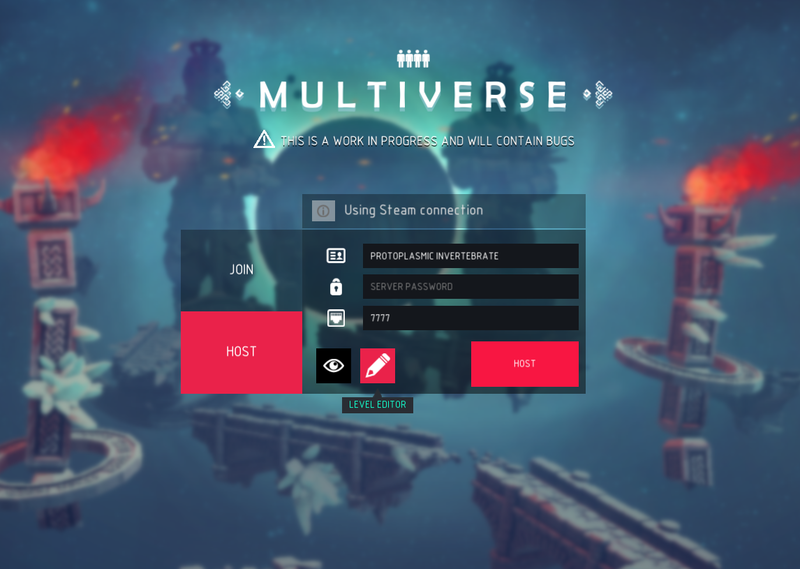 Besiege's level editor and multiplayer are interlinked to allow players to create levels together, but don't worry you can always put a password on your session and you don't need an internet connection to use it! We then need to select host and ensure that the level editor button is glowing red (which tells us that it's enabled), then we just hit host and the game will launch! 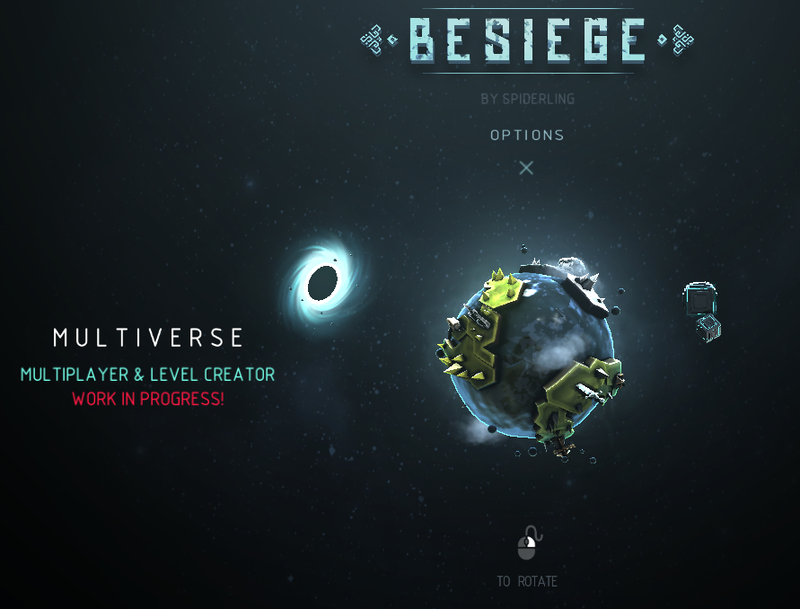 Besiege levels are created using a variety of game objects which are placed into the world and can then be edited, including; structures, foliage, NPCs & environmental effects. And for those of you wondering, we are in the process of creating assets specifically to be used in custom levels & multiplayer levels. Besiege's level assets have been divided into several different categories, making it easier for you to find what you're looking for. To place an asset into the level, you simply select it and then click somewhere in the level to place it. 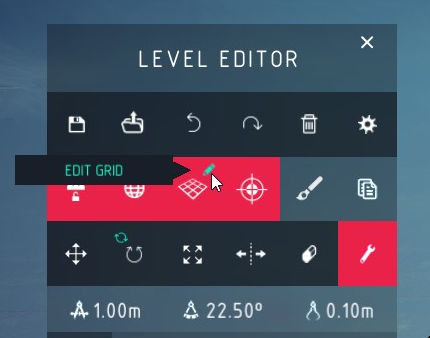 Once we have the object in the level, we can use the tools along the top of the editor panel to edit it. First we have the Translate tool, which allows you to move a selected object around the environment. Then there's; the Rotate tool for rotation, the Scale tool for altering the object's size, the Mirror tool for moving objects in relation to one another, the Eraser for removing objects and the Modify tool for editing an object's properties. The properties tool has different options depending on the object that you're editing. 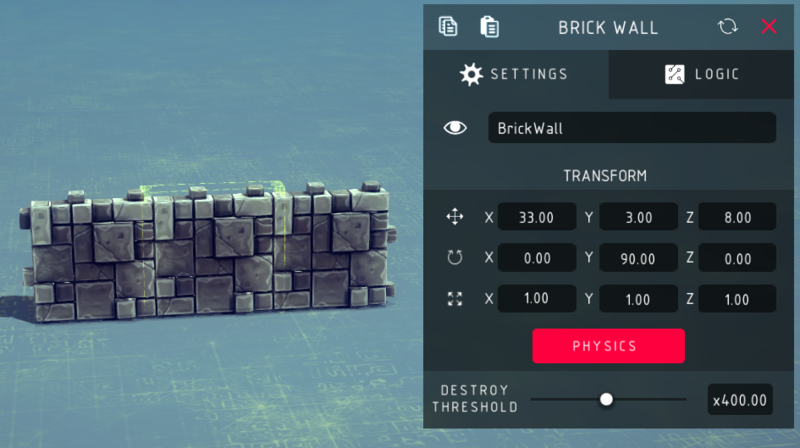 For example editing a wall allows you to dictate whether the wall works in a physics way and the amount of force required to destroy it. Turning off the physics option will cause the object to become static and not to break into physics pieces when it’s destroyed. You can also use the Properties tool to switch between several variations of certain models. Other objects such as the AI for example, have considerably more options, allowing you to change their behavior, stats and even make them friendly to a specific team! Allowing AI vs AI combat! In addition to the object tools we have some more general level editor tools as well, including; a paintbrush mode for placing lots of a particular type of object, a snap to grid option and a duplicate option which has the hotkey Ctrl + D.
The paintbrush tool works by holding down mouse button one and then moving your cursor around. Objects are then periodically placed along the path of your mouse, with random rotations and scales. Levels can be saved and loaded at will by any player in the server, these level files can be shared with other players and you will be able to upload and download them from the Steam workshop as well! 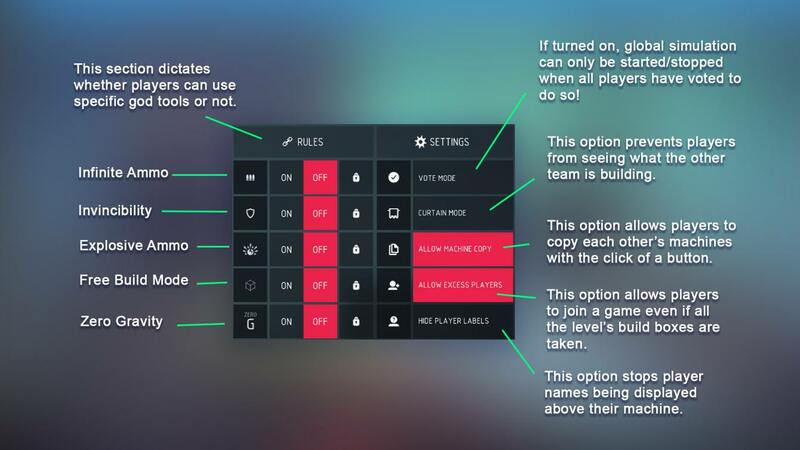 Once you're done with designing your level you can customize it further with a variety of settings including rules and limitations for players. You can access the level settings menu by clicking on the cog symbol in the level editor panel. 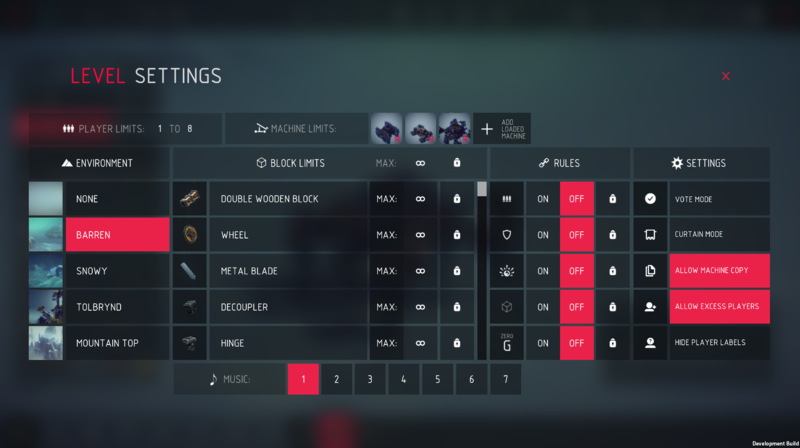 A lot of the settings in the level editor are pretty self explanatory, such as the environment and music track, but we thought we'd explain how the rules work. At the top of block limits section you can set a total block limit for each player, this will help make your level more challenging and also help increase performance. Simply click the infinity symbol and enter your own value! You can also set limits for specific types of blocks, for example you might choose to only allow players to use one bomb on their machine or perhaps disable a block all together. If machines containing these parts already are loaded into the game, the player will not be able to start simulation until the blocks are removed. If you so wish you can specify one or more specific machines which can be used with your level and all others will be prevented. This option is designed for more strict PVP sessions or racing type levels. We hope this guide proves informative, if you have any further questions about the level editor be sure to post in the forums and we or other members of the community will help out as best we can! Physics toggle seems to be bugged, I'm still able to destroy props with physics turned off, not with cannons or bombs, but by direct collision. It however does work with some, but definitely not all props (Tested with various columns and other props).